Thousands of people from all over the world travel to the Gulf Beaches for a relaxing seaside vacation, and there's plenty of hotels on St. Pete Beach that are unique and offer exclusive amenities to make them comfortable and feel like home. 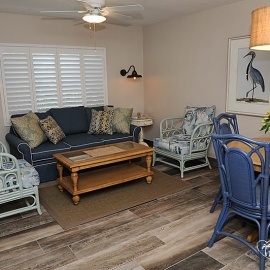 And this month, the Alden Suites Beachfront Resort on St. Pete Beach debuts exclusive bungalows that deliver comfort and style you won’t find anywhere else along the Pinellas County Gulf Coast. The Alden Suites Beachfront Resort is already a popular destination because each room includes a separate living room and kitchen or kitchenette. These bungalows are set apart from the rest of the Alden complex, and take the suites concept to a whole new level as they feel more like apartments. It's a perfect choice for anyone planning a romantic getaway, a family retreat or a long-term vacation. 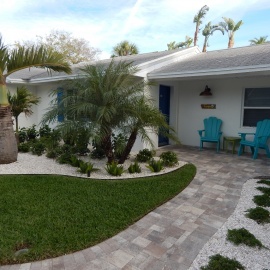 The bungalows were built as cottages back in the 1950s and recently underwent a total renovation. Stripped down to the studs, each unit has been completely rebuilt with new electrical wiring, new plumbing, new climate control systems and upgraded front porches with Adirondack chairs. According to Gary Renfrow, owner of the Alden Hotel, “We’ve completely rebuilt the cottages into bungalows. Staying in them is like having your own private beach apartment!” In the process, some cottages were merged to form bigger units and after a two-month renovation, seven beach bungalows emerged like butterflies from cocoons. The designs have a timeless, coastal vibe that is warm and comfortable, with floors featuring a wide-plank ceramic tile that looks like shiplap. It has the perfect interchange of light and dark colors to give it the appearance of driftwood, and the color palette features muted blues, greens, and ecru that provide a relaxed base to set off thoughtfully selected coastal-inspired furnishings. Sconces, lamps, and chandeliers carry the theme throughout the apartments. Bathroom and kitchen floor tiles feature a whimsical print and the modern bath fixtures, designed to pamper guests after a day of relaxing in the sun. Guests can choose between one king-sized or two queen beds, and all suites include couches that convert into double beds making these bungalows idea for a large family up to six. 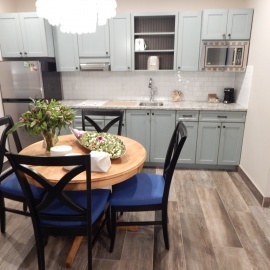 The Alden Suites signature kitchens feature stone counter tops that look like flowing water, with plenty of cabinets to store breakfast items, snacks, and drinks allowing guests to choose between making a few meals themselves or trying some of the nearby restaurants. Across the street is Dan Casey’s seafood restaurant, Snapper's Sea Grill and just down the block is Skidder's Restaurant, offering breakfast, lunch, and dinner. Other restaurants close by include the very popular 1200 Chophouse, the upscale yet accessible Castile Restaurant & Rooftop Lounge, and RumFish Grill at Guy Harvey’s Outpost featuring a 33,500-gallon fish tank. 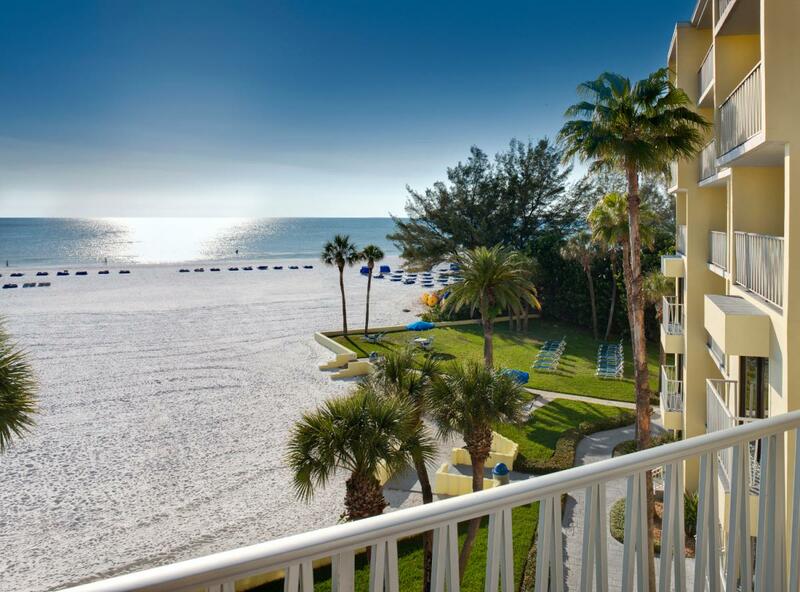 The exclusive bungalows at the Alden Suites Beachfront Resort on St. Pete Beach are like nothing you’ll find anywhere else. 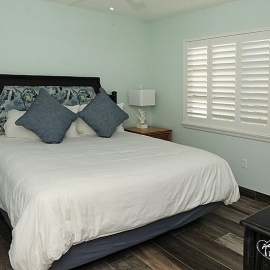 Warm, comfortable, and filled with all the modern conveniences of home, just steps away from a beautiful beach and breathtaking sunsets. Surrounded by excellent restaurants on St. Pete Beach, local attractions and sugar-white sands, they are a perfect choice for a memorable vacation. And for more vacation hot-spots, the best places to eat and drink as well as cool events in your neighborhood, check out 727area. Register for updates sent directly to your mobile phone. Best of all, it’s free! All photos courtesy of Alden Suites, Tropical Focus Photography and the author.